We got new windows and doors on Wednesday. We have lived in our house for a little over 2 years. We knew almost immediately that all 9 windows, the front door, the back door and both storm doors were going to have to be replaced. Our first winter told us we would need them sooner rather than later so we started savings up. this is the front storm door. notice the most excellent use of tape. the hinges on the front door with the variety of screws. also observe the weather stripping that wouldn’t stay put. several of the windows had to be propped open. the paint was peeling one all of them. this particular window was so rotten we were afraid the glass was going to fall out. the storm windows/screens were not the same size as the windows. there were many gaps and lots of bug entry zones. The new windows and doors are now in. The windows are ordinary, vinyl, double hung replacement windows. The front and back doors are plain steel doors with white storm doors. They are wonderful but I am not posting any pictures because the clean newness really emphasizes the fact that now we need siding (or at the very least a new paint job) and the house looks kind of odd. The first night we had them a big storm blew in with a lot of thunder and lightning. We had the windows open at first so the thunder was pretty loud. As the wind picked up, we closed the windows and we were amazed at how hard it was to hear the lightning. We are also pleased to report that the new windows block all the squawking from the birds across the street. I need to mark this day in history so that I can pull it up in a few years. Bubba and Dude are fighting over doing the dishes. Not over who has to do them but over who gets to do them. Even worse… I don’t really want to let either of them do this dishes. At 6 and 4 they aren’t exactly good at them clean. I don’t want to start serving dinner on plates thanks have smears of breakfast. I don’t want to pass out forks with crusty stuff. I decided to let Bubba do the dishes. He is doing okay. It will be his cup with milk residue. I distracted Dude with the laundry- another often chore they love to fight over. Before I go any further, let me explain t-ball and blast ball. In both, the kids hit the ball off a tee. In t-ball, they run all the bases. In blast ball, they only run to 1st base. When they stomp on the bag it makes a blasting noise. Also, in both the whole team bats then the whole team plays in the outfield- no assigned positions. In both, there are no strikes, outs, or keeping score. These things bothered me a lot about the boys playing. How are they supposed to learn the rules? Is it too touchy-feely if we don’t have outs or keeps score. However, after watching, I realized it doesn’t matter. For preschoolers and kindergartners, they just want to hit the ball and run the bases. The younger ones only have one base to help them learn which direction to run. After watching a couple of games, it works for me. Bubba’s first game was Monday night. He was into it. Hustling into the field, calling for the ball when it was in play, hitting well and running like it meant something. Not all kids on his team were into, though. There was a little boy that sat down on the pitcher’s mound. Another flopped in the dirt in the middle of the infield making a dirt-angel. Another walked up to the umpire and stared her down- like he was daring her to yell at him. Many of them couldn’t figure out how to run once they made contact. Some of them just couldn’t run. The fielding was atrocious. Bubba was a giant compared to many of the kids. Before the game, I was worried about his athletic ability. Afterwards… I am pretty sure he is phenom compared to the rest of the team. Wednesday Dude started playing blast ball. About an hour before his game, he decided he didn’t want to play and had a meltdown. We forced him to go because we are mean parents. Once he got his uniform on things were a little better. But… He was the kid making dirt angels. He roamed the outfield looking for flowers. He ran to the fence to give me a kiss (awww…). He was in lala land for the majority of the game. He came home filthy. Every time he ran he had to slide. Into the base he slid (then jumped up and bounced on it). Every fielding play he tried to make was a diving or sliding catch. When he was up to bat, though, he was awesome. Dude could hit it past the pitcher’s mound. He could hit it past the base. He was twice the size of any of the other kids on his team (and the other team for that matter) and his size worked to his advantage. He was the slugger of the team. After the game was over, he said he couldn’t wait for the next game. He had a great time. Dude getting ready to hit. I am so glad the boys are having fun playing ball. I can’t wait for the next games, either. Bubba in white at 1st base. By the way… his head is so big we had to bring his own batting helmet. My little brother got married. Woot!! What an awesome event. The bride looked amazing. My brother looked great. The bridesmaids were stunning. The groomsmen really cleaned up nicely. And all the little ones were adorable. The ceremony was great- matching their personalities perfectly. The reception was a blast. The live band, photo booth, and candy bar were so much fun. The boys were dancing machines in their Converse shoes. I am so happy for my brother. I am excited for Allyson to join our family. I can’t wait for them to make beautiful babies (in a few years). 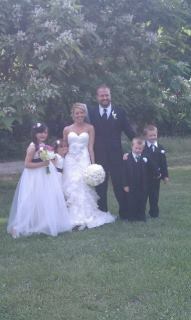 a pic of the bride and groom with my nieces, Dude and Bubba. Tomorrow I am chaperoning the 8th grade trip to Worlds of Fun in Kansas City. I have never really enjoyed field trips but I am sort of looking forward to this trip. The primary reason is that it one day closer to the end of the school year. I have had a fantastic school year but as it wraps up I am glad it is over. The kids are checking out and I am tired. Our official last day of the school is Friday but I am taking personal days on Thursday and Friday so my last day is Wednesday. I will be kicking off my summer with my brother’s wedding festival. I am really excited to be a part of his wedding this weekend. After the wedding celebration my summer will be in full swing. I will be participating in some summer professional development during the 1st week of June and working at the shoe store on Saturdays. We are going on a mission trip in for a week in July that we are really excited about. The rest of the summer will be spent chilling with the boys. We don’t have any set plans. I want to do some heavy duty cleaning and purging of stuff. We will probably go see a movie or two. I am sure I will pull out the kiddy pool so the boys can splash around. We might make a trip to the city pool (only because I love the boys and they love to go… I hate it). I am starting to look for some fun (free) stuff to do in western Missouri (Kansas City or Joplin) or things within a couple hour drive from Nevada, MO. I would love to hear any ideas you might have. We watch baseball in our house nearly everyday from April until October. If you don’t already know… I bleed Cardinal red. I was born and raised in Cardinal Nation. I have many memories of opening day pep rallies, hot summer nights at the game, skipping school on early spring days to watch the Thursday day games (oh, wait… my parents didn’t know that). The radio was always tuned to KMOX (1120 on the am dial) when the red birds were playing. The hubs is not a Cardinal fan. He grew up on the west side of the state and is a long-suffering Royals fan. 11 years of our marriage and 5 years of living in St. Louis could not convert him. Since moving to Nevada, MO though, I have to say, circumstances are leading me in another direction. DON’T GET ME WRONG… I AM FIRST AND FOREMOST A CARDINAL FAN. However, we live in an area that is considered Royals territory. If we want to watch a game, it has to be the Royals. At first this was a painful thing for me. But I am starting to root for the underdog. Don’t worry, when they face the Cards this summer I will be wearing red. The thing is my boys love watching baseball. Since the Royals are on, they are following their daddy’s love (against my better judgement…). I love to see them getting into the game. Learning baseball. Asking questions about whats going on. Knowing the players and their stats. They are excited about the sport. Every night they learn some new aspect of the game. Winning (a great thing when you are a Cardinal fan) and losing streaks (unfortunate part of being a Royals fan) The American League and the National League. Batting average and what makes a slugger. The infield and outfield positions. Tonight’s learning topic- the balk. Boston’s pitcher Bard had 2 balks in the 2nd inning. How does that happen? Balks aren’t called all that often and he had 2 within 6 pitches. The rest of the evening was spent with Dude running around the house yelling (in a deep voice) “MOOSE!! !” for Kansas City’s Mike Moustakas. Bubba kept asking if every throw over to 1st base was a balk. He probably going to go to his 1st t-ball practice questioning if there was a balk on that play. (by the way… he is not too excited about the fact that he has to hit off a tee since he considers himself a slugger. but that is for a different blog). Don’t hate me for it but I am becoming a Royals fan. Who do your baseball loyalties belong to?